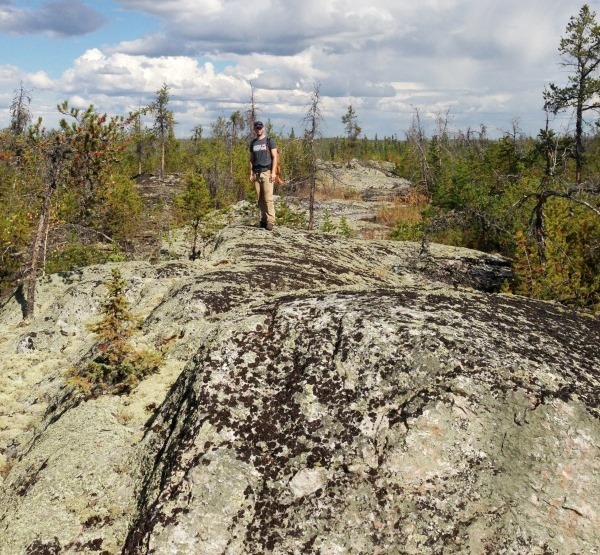 Like standing at the tip of an iceberg: One of the many outcrops of the newly discovered HL3 pegmatite returned 1.58% Li2O in a 8.8 m wide channel on the Hidden Lake Property near Yellowknife, NWT. Today, 92 Resources Corp. reported final assay results from an extensive sampling program on its wholly owned Hidden Lake Lithium Property within the central part of the Yellowknife Lithium Pegmatite Belt in Northwest Territories (“NWT”), Canada. The 2016 summer exploration program included prospecting, mapping and sampling of the known D12 pegmatite (results reported on November 8), in addition to the newly discovered HL1, HL3 and HL4 pegmatites (results reported today). At the end of the summer program, 2 additional spodumene-bearing pegmatites (HL6 and HL8) were discovered. 92 Resources explored this project from the perspective that there may be 1 or 2 pegmatites of interest, but instead they may have found an entire district. • Channel samples were cut at approximate right angles to the strike of the outcropping pegmatite to best represent the mineralization at surface. Due to terrain variations and cover, some channels may not represent the true width of the pegmatite body (and as such only represent the pegmatite outcropping at surface). • This means that only the many outcrops of a pegmatite were sampled and that these may extend below surface to form one large, interconnected body with an individual strike length exceeding 500 m; the tip of an iceberg, sort of. The depth and extent below surface can be determined by drilling, which is being permitted now. • The HL1 pegmatite has a strike length of at least 700 m, with only small parts of potentially 1 body exposed at surface. • The upcoming winter drill program will test the continuity of the HL1 pegmatite below a shallow cover. As such, drilling may uncover the pegmatite to continue below surface and thus expose the true size of a single, large body. • The HL1 pegmatite alone has the potential to be 700 m long. This could be a potentially world-class deposit by itself as not only grade matters but size as well. As many advanced lithium deposits use a cut-off grade of 0.75% Li2O, any grades above that level are generally considered great. • As indicated by the map, the HL3 pegmatite body is exposed at surface more than HL1. • With a strike length of at least 800 m, the HL3 pegmatite body has great potential to be very large/long. The upcoming drilling will test if HL3 continues below surface as one extensive body. • Only drilling can demonstrate the true size and continuity of the mineralized body below a shallow cover. However, surface expressions already indicate great potential for continuity below surface and as such another large pegmatite body on the property. • As indicated by the figure, the HL4 pegmatite body is exposed at surface less than HL3, yet HL4 occurs only 150 m from HL3 in a parallel fashion. • With a strike length of at least 500 m, the HL4 pegmatite body could also turn out to be very large/long. The upcoming drilling will test if HL4 indeed continues below surface as one large body. Up to 90 cm long spodumene crystals have been noted at Hidden Lake. The spodumene content of D12 at surface is observed to range from up to 20% with sub-intervals to 35%. The spodumene within the Yellowknife District is described as “generally light in colour and of good quality”, indicating a simple mineralogy (i.e. highly favourable metallurgy for subsequent processing into a saleable 6% Li2O concentrate). The average spodumene content in Nemaska’s Whabouchi Lithium Deposit in Québec is about 20% with light-blue spodumene crystals reaching up to 30 cm in size. D12 and HL6: Not 2 But 1 Pegmatite? • As reported in today’s news, a first grab sample from HL6 returned 1.86% Li2O, which is about the same grade as channel sampling revealed at the near-by D12 pegmatite (1.9% Li2O @ 9 m). • Aerial imagery indicates potential pegmatite outcrops between HL6 and D12, therefore suggesting that it’s 1 very large pegmatite occurring below surface under shallow cover. • The upcoming drill program will test this interpretation. If indeed HL6 and D12 are connected to eachother, the total strike length of that single spodumene-rich body could potentially exceed 1,800 m (monstrous). • Of the 85 channel samples collected from D12, a total of 52 returned >1% Li2O, with 34 samples returning >1.5% Li2O to a peak of 3.08% Li2O. Picture to the right: The spodumene-rich D12 pegmatite dyke outcrops extensively and could extend all the way, below surface and along trend, to the known pegmatite outcrop HL6 in the south. • To date, 4 spodumene-bearing pegmatites have been tested with channel sampling this summer. All 4 pegmatites returned lithium grades comparable to other world-class spodumene deposits, i.e. exceeding a general industry-wide cut-off grade of 0.75% Li2O. • Of the 223 samples collected from the HL1, HL3 and HL4 pegmatites, a total of 101 returned grades at >1% Li2O, with 59 samples returning >1.5% Li2O to a peak of 3.31% Li2O. • The total strike length of the D12 pegmatite is >300 m (potentially >1.800 m). • A total of 10 grab samples were also collected, resulting in the discovery of 2 additional lithium-bearing pegmatites: HL6 and HL8. • A grab sample from HL8 contained 0.47% Li2O and is located 2.5 km northwest of Highway 4 (Ingraham Trail). Upcoming channel sampling may bring about higher grades, especially when considering that 2 other outcropping pegmatites have been spotted in close proximity (to be sampled during the next exploration phase). • A total of 6 lithium-bearing pegmatites have been sampled on the property to date (4 of these were tested with channel sampling), all of which host significant lithium concentrations. • 5-7 additional pegmatites outcrops have been identified on the property and should get sampled for the first time with the next exploration phase. • Overall, about 12 outcropping pegmatites have been identified on the property to date, whereas more pegmatites (hidden; i.e. no surface expression) could be found below a shallow surface cover. • Due to the property hosting numerous spodumene-rich pegmatites with average grades exceeding 0.75% Li2O, it has great potential to be identified as a world-class lithium project in 2017. • The discovery of elevated concentrations of tantalum mineralization from the D12, HL1, HL3, and HL4 pegmatites (up to 596 ppm Ta2O5 with an average of 64 ppm) is a potentially significant discovery. Often, tantalum and lithium are strongly zoned with mineralized pegmatite bodies; however, meaningful zone overlap may exist and has been demonstrated in the past through co-production in other deposits known worldwide. Anomalous rubidium and beryllium mineralization has also been identified, but will require further analysis. • A sampling and winter drilling program is expected to start in early 2017. As can be seen with the accompanying figures from Deutsche Bank‘s research “Welcome to the Lithium-ion Age“ (May 9, 2016), the average deposit grades of most world-class spodumene deposits range between 1% and 1.7% Li2O, and rarely exceed 2%. The 3rd committed project, according to DB, is Albermarle‘s La Negra Lithium Brine Project in Chile.